Britain has been trying for over 20 years to come up with an iconic thrash band to match the likes of Metallica and Slayer from the US or maybe Kreator and Destruction from Germany. Many have tried...and many have died. Some of the notable names that almost made the grade are Xentrix, Toranaga, Reanimator and my personal favorites, Deathwish. But for one reason or another, none were able to seize that brass ring of thrashing immortality. With Evile, the UK at last has a worthy contender. Things have been moving fast and furiously for these guys since their excellent Earache Records debut "Enter The Grave". That particular disc was one of the very best Bay Area inspired plates of speedy mayhem to come out in the modern era, but the question was, could the guys follow it up? Well, their most recent disc "Infected Nations" throws a fooking big "Hell, yeah!" in answer to that question. Bigger, more complex and more mature than the debut, it's a great second shot across the bow from the dudes. And they are going to follow it up in time-honored fashion, by touring their balls off. I caught them on the recent Killfest 2010, opening for the mighty Overkill and impressing the hell out of fans in attendance. 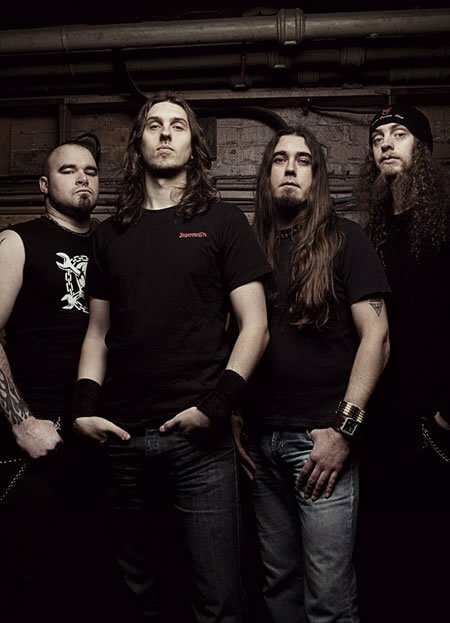 Guitarist Ol Drake was kind enough to take me backstage and give me the lowdown on the highs and lows of Evile's rise to prominence (and there's been plenty of both, including the shocking sudden death of bassist Mike Alexander). WORMWOOD CHRONICLES: This is a really huge tour you're on. How does it feel to be out there with the legends, bands that you grew up with? OL DRAKE: It's kind of like a dream come true. I did grow up listening to bands like Kreator, Overkill and Megadeth. To be on the same stage with them is like a dream, it's not real. It's unbelievable. WC: Do any of these older bands kind of take you aside and say, "Son, I've got some stories about back in the day?" OD: No, no, they're all really cool and laidback. How's it going? and all the normal stuff. I have to say, it's going great! WC: A lot of bands have highs and lows but this year you've had really high highs...and really low lows. You lost a comrade and a brother in Mike Alexander. Has everything really sunk in yet? WC: That, and everything...the big tours, the whole whirlwind. OD: Everything is just beginning to register. We've been out for three and a half months now but it just seems like a couple of weeks. It just rushes by. As far as Mike's death goes, we did have quite a bit of time off afterwards to be on our own and just think things through. When we had done all of that, we said, alright, we need to get up and get busy, it was just as simple as that. It was really awful, what happened, but it would be an insult to Mike not to carry on. Let's get back together and get back on tour. WC: Would you say playing live is the best therapy? OD: Yeah. Playing without Mike the first time was pretty strange but we get along with Joel really well. WC: Did you know the minute you saw Joel that he was gonna be the man to replace Mike? OD: Before he actually played for us, actually! We had a bunch of guys try out for us who were really cool guys and good players but there was just something that wasn't there. As soon as we started talking to Joel, we knew before he even put the bass on that this guy was pretty cool. And then we heard him play. WC: He exceeded your expectations? OD: Yeah, absolutely. We're glad we've got somebody we really get along with, because we're on stage with him for an hour every night but then we have to be together for the other 23 hours, too. You've got to get on with each other or it's not going to work. WC: Your new CD "Infected Nations" was quite a bit more ambitious than "Enter The Grave". Was that the plan or did it just happen that way? OD: All the material on the first album was written before we were signed to a label, when we were just having fun and thrashing. Then we got signed and a second album came up. Alright, we have to get serious now! We can't really do a carbon copy of the first album. When we wrote riffs for "Infected Nations", we thought, how can we write this to make it a bit different, to make it unique? WC: You did a huge instrumental, "A Hundred Wrathful Deities". That was something even a lot of established bands would be leery of. What propelled you to do a song like that? WC: Were you happy with how it turned out? WC: Is it something you'd try again? OD: Yeah, I've got a second part to it. (chuckles) It's not the same, it's quite the opposite to the one on "Infected Nations". WC: The lyrics seems more serious on the new album as well. What exactly is the "infection" in "Infected Nations"? Is it greed? Pride? OD: Well, it's Matt's concept so I can't fully describe it like he could. It's basically a view of what's happening in the UK. but can also be applied to the rest of the world. It's about how nobody does anything for the community anymore, they're all out for themselves. It's self-interest, it's a form of evil. WC: It could easily be about the States as well. OD In Matt's concept of the cover illustration, there's a kind of medieval figure that represents the evil of mankind and that holds the world hostage. There are people caught in the roots of the figure that are trying to fight their way out of the evil but they just can't. WC That cover art is pretty amazing. It was done by Michael Whelan, right? OD: Yes, it was great that we got him. WC: He's pretty selective about who he works with, as well. WC Will you work with him again? OD: Yes. We've already got the next album's concept and title. We are working on it way in advance. WC: Do you come up with your best ideas when you're on the road? OD: There's no telling when or where an idea will hit me. We were travelling by train once and I heard the tracks going "cha-chung, cha-chung" and I came up with a riff to go along with it in my head. Wow, that's cool! WC: I know a lot of songwriters keep a little tape recorder so they can hum a riff or melody into it. WC: It's got to be encouraging for you to see British metal coming back again. In the 90's, it seemed on the verge of extinction. OD: The classics were still around, though. WC: True, but now there are a lot of new bands coming along. You're at the vanguard of that. How does that make you feel? OD: It's a great compliment. I don't really see us as the best from the UK. We're just doing what we do and we're happy we're where we're at. WC: Is there any new band from the UK that's a hot prospect? OD: There's a band from London that hasn't been signed yet called Mutant. They are a really unusual thrash band that mixes thrash with prog influences. It's like futuristic thrash, if you will! They are quite impressive. WC: There's another band from there that I like called Savage Messiah. Similar to Testament...they're really good! OD: We toured with their singer's old band, we go back with them a ways. WC: It sounds like you've got the next album pretty well thought out. OD: Yeah, I've got about four songs actually written as well as some other ideas. Matt''s got some songs in mind. We are picking away at it. WC: What was the last album or CD you got just because you wanted to pick it up? OD: The last CD I actually bought was "Devolution" by Destruction. I've always been a Destruction fan...Mike was, as well. I heard it was really good so I bought it and....Wow! They've still got it. They've been at it for 20 some years! WC: Yeah, the last time I saw Kreator, it was the same thing. The guitar work is phenomenal. Not only haven't they lost a thing, but they seem to be getting better at it as they go along. WC: Who was the last band you saw live just because you wanted to check them out? OD: I think it was Testament, quite a while back, because it was one of their first shows back with Alex Skolnick. It would have killed me to miss that! We've been so busy recently, I just haven't had time to see anything else! WC: Is there any kind of "Spinal Tap" moment for Evile that you'd like to share with the fans? OD: Just check us out! If you don't like it, don't listen to it! If you like thrash with a lot of energy, you'll like us!